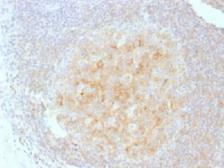 Specificity/Sensitivity: This antibody is specific for CD40. Specificity/Sensitivity: The antibody specificity is confirmed by specific peptide inhibition in immunoblotting studies. Specificity/Sensitivity: CD40 is a receptor on antigen-presenting cells of the immune system and is essential for mediating a broad variety of immune and inflammatory responses including T cell-dependent immunoglobulin class switching, memory B cell development, and germinal center formation. AT-hook transcription factor AKNA is reported to coordinately regulate the expression of this receptor and its ligand, which may be important for homotypic cell interactions. Adaptor protein TNFR2 interacts with this receptor and serves as a mediator of the signal transduction. The interaction of this receptor and its ligand is found to be necessary for amyloid-beta-induced microglial activation, and thus is thought to be an early event in Alzheimer disease pathogenesis. 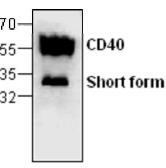 CD40 is expressed on B-lymphocytes, follicular dendritic cells, bone marrow-derived dendritic cells, thymic epithelium, and interdigitating cells in the T-cell zones of secondary lymphoid organs. 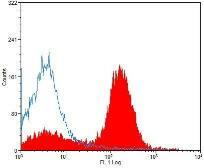 Specificity/Sensitivity: This antibody was selected for its ability to detect human CD40 by ELISA.